Bronze medallist earlier in the year at the Buenos Aires Youth Olympic Games, Kanak Jha added to his collection of silverware at the 2018 ITTF Pan American Championships in Santiago, Chile on the evening of Sunday 25th November. The top seed, he won the Men’s Singles title beating Argentina’s Horacio Cifuentes, the no.5 seed (12-10, 13-11, 11-4, 9-11, 11-8) in the final. Players who will undoubtedly feature prominently, within the boundaries of the Pan American continent and beyond in the next decade and more; it was very much a contest that in the early stages reflected their two previous meeting on the international stage. Both in Boys’ Team events, both in 2016, Horacio Cifuentes had prevailed in Burnaby at the inaugural ITTF Pan American Junior Championships, later in the year Kanak Jha had succeeded at the Sun International World Junior Championships in Cape Town. In the final, Kanak Jha secured the opening game, saving one game point; in the second, once again he prevailed by the very minimum two point margin on his third game point. Successes by the narrowest of margins, for the first time in the contest there was daylight; Kanak Jha won the first three points of the third game. Horacio Cifuentes called ‘Time Out”. The break was in vain for Argentina, Kanak Jha never relaxed the grip, he held a three games to nil lead. Now with breathing space, in the fourth game, Kanak Jha established an 8-5 lead; arguably playing in a more relaxed manner, the backhand positive, Horacio Cifuentes levelled at 9-all; then won the next two points. Hope for Horacio Cifuentes but there was to be no sensational recovery; in the fifth game, as in the first two, there was little to choose. At 7-6 Horacio Cifuentes held a narrow lead; the next two points were won by Kanak Jha, Horacio Cifuentes called “Time Out”, advice from Jörg Bitzigeo and Matias Alto, the respective coaches on duty, the players returned. The next two points went to Kanak Jha, three match points, the first was saved not the second; the top step of the podium belonged to the United States. Success for Kanak Jha meant he emulated Puerto Rico’s Adriana Diaz; in mid-July, both had emerged successful at the 2018 ITTF Pan American Junior Championships. 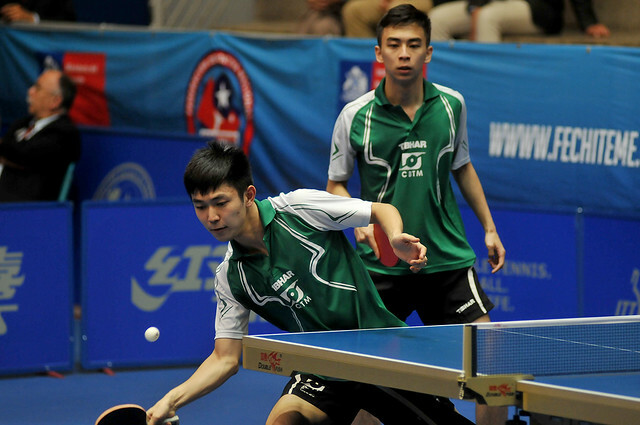 Both repeated the feat at the Sparta 2018 ITTF Pan American Championships. Now for the whole continent, from north to south, east to west that is good news, very good new indeed.